In consonance with the previous post and with this blog in general is card 36 of the series. I did this close to President’s Day under a fairly warm sun so that this homage to the Lincoln Memorial was not fated to last long. Also, unlike my massive busts of other famous people, the head on Abe here is only a little larger than a real head. A few days after sculpting this one fellow grumbled that it didn’t look like Lincoln – this after a few days of the sun taking its toll. That’s why I took a photo immediately after completing the job. ( I like the askew tie that sculpture Daniel Chester French showed in the original at the Lincoln Memorial). 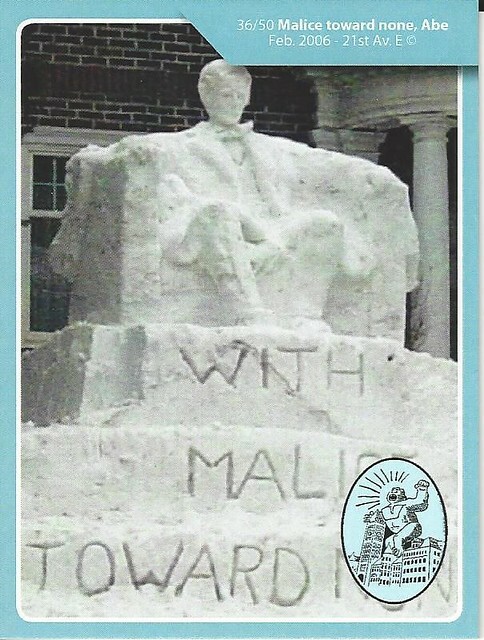 Some time later students at UMD asked me to sculpt Franklin Roosevelt out of snow using the newly discovered photo of him sitting in his wheelchair. It was to be built in honor of the Americans with Disabilities Act. Such photos were almost unknown in Roosevelt’s lifetime as he was always pictured from the waist up or standing and hanging for dear life to podiums. Sadly, snow is much harder for me to fashion into delicate features. They are better made large and viewed from a distance.